The project is included in Operative Program of the European cross-border territorial cooperation “Alcotra 2007-2013″. It brings together specialized scientific expertise Italian and French that deal to study the mountain and its dangerousness. It is divided into a part of studies conducted on the entire framework of the Western Alps and in actions on the pilot sites identified by the project. The project was aimed to improve risk management in the Alps and in particular to give practical answers and theoretical application to the risks due to the reduction of the volume and the surface of the glaciers in the Western Alps. The acquisition of a deeper level of understanding of these phenomena is essential for rational land use planning. 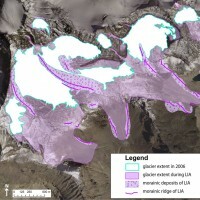 The following activities were carried out: a photointerpretation to locate and quantify the glaciated areas and make a geomorphological mapping of the areas recently deglaciated; a classification of the types of hazard; an application of semi-automatic methods for determining the areas prone for debris flows; direct analysis and monitoring in pilot sites. The research carried out led to a more thorough assessment of the effects of climate change in the Western Alps in relation to glacial and periglacial hazards. The collaboration of experts from different fields of science and of different nations and the easy access to the results obtained during the project can facilitate collaboration in the management of cross-border territories. They were produced: an inventory of the glaciers of the Western Alps; a geomorphological mapping of the glaciated areas during the LIA; a classification of the types of hazards; a zoning according to the predisposition to instability and the understanding of the mechanisms of instability in the five monitored pilot sites. Through a multidisciplinary approach it was possible to analyze the complexity of the hazards of glacial and periglacial origin and clarify the key points for a risk assessment. A better understanding of the glacier dynamics over the past 150 years, obtained through the project, is essential for a rational land planning and improved risk management. Client: Commissione Europea attraverso il FESR e cofinanziato da Italia e Francia. Progetto Alcotra 2007-2013 n. 056.